On Tuesday, April 4th, Chicago NOW sponsored and participated in Chicago’s 7th annual Equal Pay Day Rally. Equal Pay Day marks when women’s earnings “catch up” to men’s earnings from the previous year. 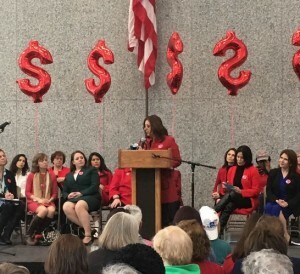 At the rally, many community leaders spoke about the impact that earning .80 cents to the dollar has on women, specifically, how it prevents women from saving for retirement and reduces the Social Security benefits they receive. Annually, the wage gap represents $10,500 in lower annual earnings for all women compared to men. Though the Equal Pay Act passed over 50 years ago, the wage gap hasn’t closed due to a myriad of issues. To help close the gap, Chicago NOW actively advocates for the Paycheck Fairness Act, strong family leave policies, expanded access to affordable child care, and an end to allowing potential employers asking about salary history during the hiring and interview process. While April 4th is observed as Equal Pay Day for all women, it is important to note that the wage gap between men and women is magnified amongst women of color. White women and Asian women are paid just 75% and 85% of what white men do, respectively. But African-American women receive just 63% of what white men do; and Latinas face even bigger disadvantages, at 54%. As we observed April 4th as Equal Pay Day for all women, Chicago NOW will also observe July 31st as Equal Pay Day for African-American Women, and November 2nd for Latinas.